Six Sigma is a problem-solving methodology aimed at improving business and organizational performance by using a number of methods and tools. It primarily identifies and corrects errors and defect in manufacturing and business processes. Although Six Sigma was originally introduced in the 19th century with the bell curve by Carl Fredrick Grauss, it turned out to be inadequate and needed some corrections. It was brought back to life back in the mid-1980’s when Motorola was facing a crisis: their product had poor quality, which affected their competitive advantage as they were struggling to beat the competition and secure their place on the market. Motorola came up with an idea to develop Six Sigma Management System and reduce the variations in manufacturing processes that were causing defects. The results were stunning. The level of quality of certain Motorola products experienced a tremendous increase, which encouraged other big corporations to follow the same path. Since then, many worldwide companies have adopted the Six Sigma approach with all its tools and techniques, and have saved hundreds of billions of dollars. Engineers at Motorola developed a scale that should evaluate the quality of processes based on their defects. At the top of the scale is Six Sigma, which is 99.9997% defect-free (or in other words, if you make a million car cylinders, there will only be 3.4 defects). This means that if your processes run at Six Sigma, they almost have no defects. 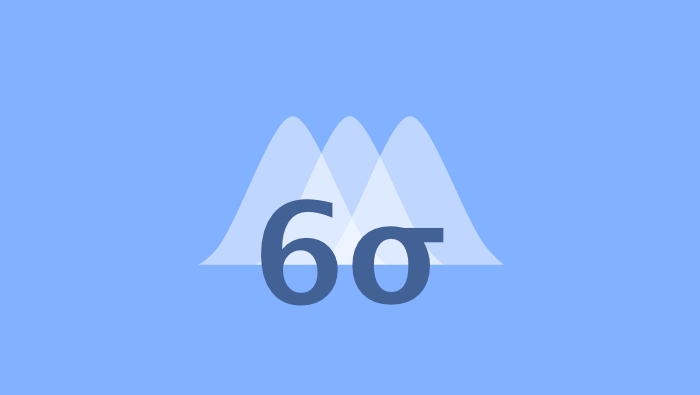 Six Sigma scale shows how well an important feature performs compared to its requirements. The lower the sigma level, the bigger the number of defects. Naturally, most businesses operate at 4 or 5 Sigma, which means that the losses that result from the poor quality cost them 10-15% of their revenue. The following table shows the universal Six Sigma scale. Six Sigma performance is a statistical term that refers to a process that produces fewer than 3.4 defects (errors) per millions of opportunities for defects. Define - you need to define the problem and clearly outlay your objectives. Your definition should include the exact problem with numeric representation and shouldn’t be vague. Measure - once you define your problem, you need to decide what measurements to use to quantify the problem. You have to identify what part of the product is damaged, when they were damaged, and what's the level of the damage. Analyze - after measuring, the next step is to collect and analyze data. At this point, it’s important to determine whether the error is valid or it happened at random, without any specific cause. You can use the collected data to compare it against measurements and evaluate its success. Improve - the next stage includes developing solutions to the problems. Your team should create a test and launch pilot studies to find the most appropriate solution. After coming up with a solution, your team can start building a plan and developing a timeline. Control - finally, in order to keep things under control and prevent recurrence, you need to perform control measurements monthly, daily, or yearly. Process optimization tools that allow you and your team to create more efficient workflows. Statistical analysis tools that allow your team to analyze data more efficiently. To be able to do calculations, you need to incorporate the tools into Six Sigma software, which will do the rest of the job for you. It will help you identify customer requirements and rate them on a numerical scale. Next, you list various design options and list them based on their ability to address customer needs. Finally, the designs with the highest scores will become the solution that you should implement. It helps you identify which variables you should study further. First, you start with the specific problem and list all the variables in their respective categories that are affecting the problem. After listing all the variables, the expert team should determine which variables are most likely to be causing the problem.The diagram looks like a fish skeleton, hence the name of the diagram. It helps your team identify, explore, and display all the possible causes and finally find the root cause to the problem. This tool allows you to focus on other processes and activities other than the issues that arise during the project development. This lets you list all possible failure scenarios, come up with solutions, and rank them according to how well they address your concerns. Finally, your team can prioritize things that could go wrong and develop necessary preventive measures. Since most large corporations and big industries incorporate Six Sigma into their business, the incorporation process requires not only ample time and energy but also huge financial resources. No matter what approach you choose, you need to keep in mind that Six Sigma focuses on the team and not on the individual. Each team has a certain level of certification that depends on the degree of their expertise and responsibilities. 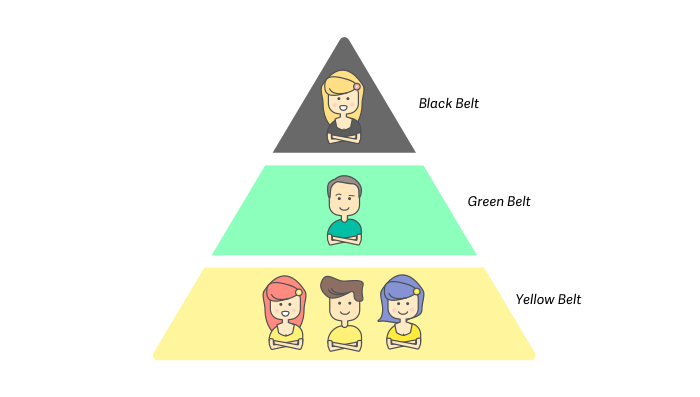 Yellow Belt - everyone else on the team. These employees don’t know every project detail and therefore don’t need to have extensive knowledge of Six Sigma. However, they are essential to the success as they help Green Belt people achieve their goals. After the big Motorola success, many companies from manufacturing and transactional industries (banks and hospitals) to oil industry and even entertainment industry have incorporated six sigma methodology in their framework. For example, while General Electric profited from $7 to $10 billion in 5 years, Bank of America saved hundreds of millions of dollars within the first 33 years of launching Six Sigma. Six Sigma is inevitably a path to a dramatic improvement and brings immense value not only to the company but customers as well.